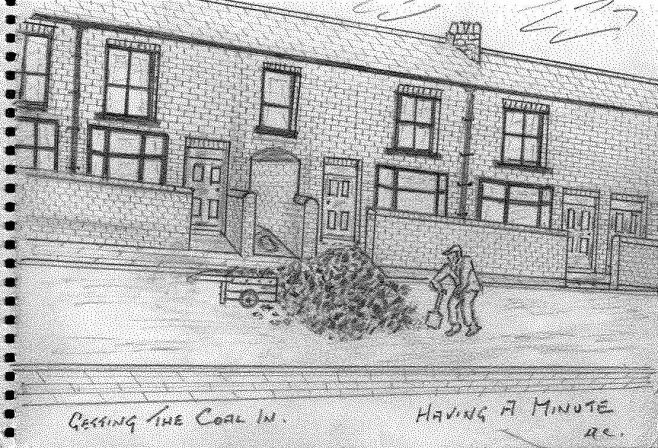 This is my memory of how coal was delivered to a house and tipped at the nearest access to the rear of the house where the coal was kept in a coalhouse. It took quite some time to barrow the whole load round the back !!! The lorries would have three separate tons of coal on the back, each ton would have it’s own separate tailgate, which when opened by bottom pins on the gates, they hinged and allowed one ton at a time to slide off the lorry and be tipped. It was a common sight to see this when every house had a coal fire..
We had a cellar too and I didn’t like going down there to fill the bucket with coal! The light had to be plugged in before you opened the door or it was too dark. The stairs were rickety too. Yes we had the meter down there , we always had to have a reserve of shillings. We to had a coal cellar, at the bottom of the stairs was a large stone slab on the right which was the nearest thing to a refrigerator, on the left was a large compartment where the coal was stored. The electric meter was also on the wall and to put in your shilling you needed to climb over the coal, which was delivered by Crowders Coal Merchants who were based on the junction of Newgate Lane and Bowling Street. They tipped on the toad no such thing as sacks in those days. During the early part of the war we slept down there for many weeks, my grandmother, mother, sister and one of my aunties. My grandfather was on nights at Crown Farm pit. My father was in the RAF based at Newark as an Airframe Fitter with the 52 Maintenance Unit. he Lived at Home travelling daily when not having been posted to one of the Lancaster bases in Lincolnshire for short periods. My Grandmother made Elderberry Wine and Nettle Beer (the latter having a tendency to blow up), which was our excuse for a fridge plus rabbits and chickens and other food stuff that needed to be kept in a cool or cold environment. Nobody seemed to moan we just accepted it as I recall. We had coal delivered, but reading the above comments I guess we were ‘lucky’ as we had a cellar. But there was still an amount of shovelling to be done. And as a ten year old it was my job to shovel any remaining coal from the area in the cellar where the next delivery would be dropped down the shute. I guess the hard part was carrying the full coal bucket up the cellar steps. We were a much tougher generation in those days. No thee rete there Peter it didn’t, kids today don’t no thee born! and as time went on coal was delivered in bags and bye heck mother used to count every bag – woe betide if one was short !!!!! Coal lorries - I to remember them Peter. Yes coal was dropped in the road as you say and with Dad not having a ‘wheelbarrie’ we had to fill tin buckets and carry them up the genull to the coal ‘us. As a little lad this was hard, and all this had to be done before we went to school !!!!!!!!!!! We had to sweep the the slack up also nothing was left in those days. Happy days long gone . I remember those coal lorries with the three compartments very well my friends dad drove the one that brought the coal to my parents house. The first one I remember was hand cranked to tip the body, I think it was a Morris Commercial. If you were the first customer you probably got well over a ton because when it was tipped enough for the first load to slide off coal from the other two compartments rolled over the gates that were seperating them onto the first load. If you were the last customer you probably only got about 15 hundredweights, no weights and measures in those days. We had our coal from Thomas Ince in the 1950s his coal yard was opposite the Westfield Hotel near the junction of Ladybrook Lane and Westfield Lane. There was also a betting shop at the coal yard before betting was allowed off the racecourse. My grandad liked a little flutter on the horses and I remember going round there with him to put a bet on, all very secretive, a cherished childhood memory. On a street that housed many miners and their families, it wasn’t unusual to see half a dozen or even more loads of coal tipped in the street at one time. I remember a law coming out that if a load of coal was still left out on the street after dark, the owners of the coal could be summoned. This came about after the injury of a person driving a vehicle did not see the heap of coal.